Despite the cautionary tales that the new science-fiction movie, “Jupiter Ascending” was two-thumbs down, I went to the theater anyway. Plopping down in my seat, I decided I’d keep an open mind despite harsh reviews from friends, and even my mother, that the movie was plain terrible. 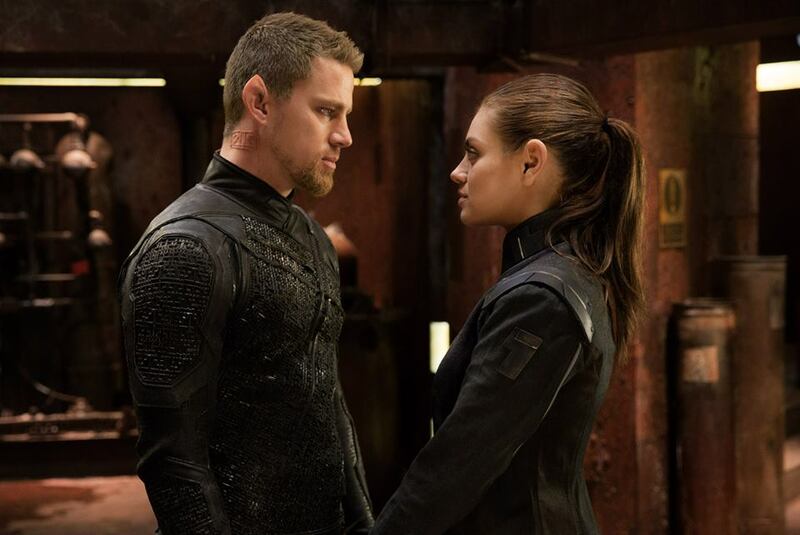 Let me tell you, “Jupiter Ascending” is pretty bad, but in a way that makes it a delight to watch. The story is about Russian immigrant and cleaning lady, Jupiter Jones (Mila Kunis), who discovers she is the reincarnation of the matriarch of the Abrasax family, an intergalactic royal family. The other members of the royal family, Titus Abrasax (Daniel Booth), Kalique Abrasax (Tuppence Middleton), and Balem Abrasax (Eddie Redmayne), try to trick Jupiter into giving up her control over the Earth. She is aided by her love interest, space werewolf Caine Wise (Channing Tatum), and his old mentor, Stinger Apini (Sean Bean). Kunis as Jupiter Jones has the Cinderella role locked down. She has no father, a family who doesn’t understand her, a life spent cleaning up after other people, and a handsome man who comes to take her away to happiness. Sure, it’s cliche, but not usually seen in action movies. Caine may not be the traditional white knight, but he is Jupiter’s savior for sure, though the movie makes sure to paint him as her equal. The plot is overshadowed by the many spaceship battles, chase scenes, and explosions, that characterize a typical science-fiction movie. There is even a scene where a planet is revealed while dramatic music swells in the background. It is nothing that hasn’t been done before, but what makes this movie unique is that it is an original space opera, a genre that has been sorely lacking absent in recent films. The special effects range from ridiculous — Caine riding around on what are basically Heelys sneakers for space — to stunning, when Jupiter is enveloped in a swarm of bees. The costumes, designed by Kym Barrett, are gorgeous and go the extra mile for every character. Although many aspects of this moving are flat-out bizarre, like how the bees can sense royalty, others are actually sweet. Jupiter makes the decision to choose the Earth over her family because she knows that even the poorest person has value. Props go to Redmayne for playing the stereotypical villain and a spoiled mamma’s boy, who talks like someone’s stepping on his throat, all while wearing sparkles. The romance between Caine and Jupiter is nothing special, but I dare you to try and not laugh when Jupiter tells Caine, “I love dogs,” in order to try and convince him that they should be together. While the love story is predictable between Jupiter and Caine, the audience appeared still pleasantly surprised when the two embraced and kissed. This movie is definitely over-the-top, but as I sat in the theater, I realized that I had the privilege of watching a cult classic being born. I left the theater feeling like I had definitely gotten my money’s worth and was glad that I kept an open mind.